Saturday night four clowns from Caring Clowns International (CCI) descended on the Meydenbauer Center in Bellevue Wa for the Prosthetics Outreach Foundation annual fund raising auction and dinner. We clowned, juggled, made balloons… for adults. We provided entertainment while the silent auction was going on and and carrying cakes for auction during dinner. What most of the guest didn’t know was our most important mission that evening was to present the foundation with a check for $4,500. This completed a commitment we made to raise $10,000 for club foot education and emergency surgery program in Vietnam. 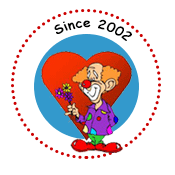 Since our first donation of $250 in 2003, CCI has donated $21,500 to POF. This is what we do, won’t you join us?